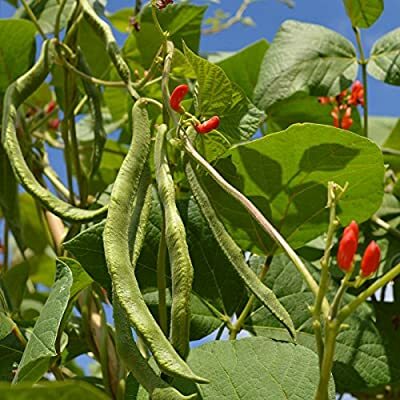 Scarlet Runner Pole Bean Garden Seed. Phaseolus coccineus. Also known as Scarlet conqueror, fire bean, mammoth, red giant, scarlet emperor & white dutch runner.Their abundant red, pink, or bicolor blooms are attractive to hummingbirds, and this plant is often used as an ornamental. Pods have a rich, delicious flavor, and should be picked when fairly short, between four and six inches, and used as snap beans. Once the pods become too tough for snap bean use, the immature seed can be shelled out, or allowed to mature and dry. Dried runner bean seed can be cooked like dried common bean seed. Height - 6 to 9 feet. Spacing - 6 to 8 inches . Spread - 18 inches. Growth Habit - vine. Runner beans are at their best when fresh, young and tender. They should be harvested when the pods are less than full length, snap easily and while the seeds are still small and pale in colour. Picking green beans often help to promote more growth and increase yields. As the pods get older they develop string and the pod-walls become more fibrous, with pronounced bumps on the surface indicating that the seeds are enlarging and that moisture is going into the seed from the pod.